Check out this new site we, at Bancs Media, made for our good friend, Michael Dorf. 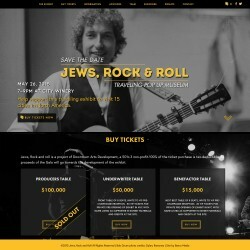 It’s called Jews, Rock and Roll, a traveling Pop Up Museum and it will tour as a traveling exhibit for traditional museums, exhibition spaces, and “Pop-up Museums” in short-term storefront rentals in 10 to 15 cities across North America. Over 500,000 people will see the 5,000 sq. ft. exhibit over two-three years. The exhibit is organized, around five specific eras: The Rise of the American, The Rise of the Teenager, The Rise of Counter Culture, The Rise of Record Industry, The Rise of the Post Modern/Ethnic American. The exhibit tells the story of Jews in America, illustrating the history and influence of Jews in popular music from the 1930’s to today’s pop stars. This exhibit explores how a small group of immigrants had such a significant and positive influence in shaping American pop culture. If you’re in NY on May 26th go check out their launch event! Tickets here. New Products In The Store Now!What do you think about fame?